How was your month? November was a busy, but pretty good month. I can’t believe that there’s only one month left in 2018. Did this year fly by or what? 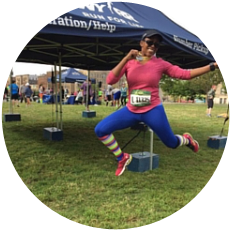 As usual, since it’s the last Friday of the month, I’m linking up with Marcia from Marcia’s Healthy Slice for Runfessions. Let’s get started! Thanks again to Michelle (@runattitude) for posting about this challenge on Instgram. I really enjoyed taking time out each day in November to think about what I was most thankful for that day. It definitely helped me to stay in a more positive head space throughout the month. I am running the Kiawah Half Marathon next weekend but after that I don’t have any races on my calendar until April 2019. Now I’m sure that will change eventually, but I am glad that I’ll have some time to decompress. I’ve been having some back/hip/foot/knee issues (basically everything) for a few weeks now. My issues started after RnR Philly. I wore a pair of neutral sneakers (Brooks Launch) for the 5K and the 10K and I had good amount of foot/leg pain after that. I think those sneakers are better for shorter distances. All of my longer distance sneakers are tapped out or near retirement, and my feet didn’t love the new Mizuno wave inspire sneakers, so I’m kinda stuck. I did get my gait analyzed at the Rock n Roll expo yesterday and they gave me two sneaker recommendations so I’m going to try those. I’ll also be adding in some extra leg workouts starting next month to work on making my legs stronger. I runfess that I’m so happy that I’m off work next week! As usual, I had a lot of vacation time to use before the end of the year so I decided to take off next week. I’m happy to have that time off to get a lot of stuff done, including completing my Christmas shopping. While I do a lot of shopping online, I need to see/feel/touch certain things to make sure it will be a good gift for someone. Now I know I said I would NEVER train for another Fall marathon, but if I get into the 2019 Chicago Marathon, all that will change. I still feel like I have unresolved issues from the 2017 race and I would really like to go back to the course and actually enjoy the race. Also I know of a few awesome ladies that also entered the lottery and if we all got in that would be amazing! These women would make a great support system while training. Between the below freezing temps on Thanksgiving and seeing all the snow in the midwest, I have a feeling that winter running is going to be intense this year. That’s okay, it just means we have to use more layers, right? Hopefully it won’t be extremely cold AND have lots of snow. The cold is one thing to deal with, but snow just makes everything 10x worse! That’s it for this month – thanks for reading my runfessions! I hope that you have a great weekend! I’m also linking up for Friday Five 2.0 with Lacey and Meranda from Fairytales and Fitness. Do you have anything you want to runfess for November? I can’t wait to hear all about San Antonio! Hope you and mom have a great time. I think we are all ready for a break of sorts this time of year. Thanks! So far it’s great. It’s a really cute city and everyone is so friendly! I hope you’re having a great time in San Antonio! I’m sorry to hear about your leg/hip issues…hopefully the recommended shoes will turn things around! Ooh Chicago Marathon! I hope you get to run it again! Thanks so much for joining me on the gratitude challenge! I agree that it did help to keep me in a more positive frame of mind. Chicago would be awesome if the lottery gods are kind to us! Hope you’re having fun in San Antonio – can’t wait to hear all about it! Yes I’m looking forward to hearing about the Chicago Marathon lottery results! I’m training until Feb so I hope you’re wrong! And I HATE training through winter (rarely do it). Hope you enjoy San Antone! Sorry abut the shoes, Funny, I must be weird — I like more cushioned for short runs, more minimalist for my long runs. I’m definitely a neutral runner though. I do hope that we don’t get a lot of snow this winter – I’m still keeping my fingers crossed for that! Thanks for the well wishes for Chicago! I’d like to think November weather was tough but it’s going to be mild here on out all the way until I run Tokyo. If it’s harsh I don’t know how I’m gonna train. Ugh. I’m in the same boat with a long run shoe. I’m running in old Asics since my Mizunos betrayed me. The rest of my shoe rotation is for short distances. Enjoy your week off! I am keeping my fingers crossed for you that the winter weather is mild. I know doing super long runs on the treadmill is definitely not appealing!